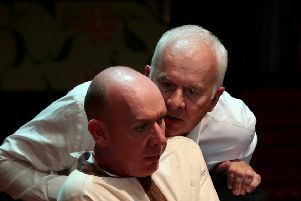 Nottingham Playhouse’s intriguing Conspiracy season continues with a production of John Webster’s The Duchess of Malfi. Directed by Fiona Buffini, it can be seen at the theatre from Friday, October 30 to Saturday, November 14. In one of the most celebrated plays of the Jacobean era, a secret marriage provokes fury, espionage and bloody murder in John Webster’s tragedy. Following on from her critically acclaimed roles in Henry VI Parts 1, 2 and 3 as well as A Midsummer Night’s Dream at Shakespeare’s Globe, rising star Beatriz Romilly plays the title role. When the Duchess of Malfi marries below her class, her brothers – a ferocious Duke and ice-cold Cardinal – set a dangerous spy against her. Their scheme spirals out of control until a nightmare engulfs them all. Fiona Buffini, associate director of Nottingham Playhouse, directs this blood-soaked masterpiece, following her critically acclaimed productions of Time and the Conways and A Skull in Connemara. The Duchess of Malfi is the third main stage production in Nottingham Playhouse’s Conspiracy season, following on from the return of the Olivier Award–nominated co-production 1984 and the regional premiere of the award-winning The Rubenstein Kiss by James Phillips. Nottingham Playhouse artistic director Giles Croft said: “Our Conspiracy Season explores our society using the theme of tension between the individual and the state. “This resonates so strongly when mass surveillance is at an all-time high and individuals are in danger of losing their right to have a say. For ticket details and more information on this production of The Duchess Of Malfi, go to www.nottinghamplayhouse.co.uk or you can call the box office there on 0115 9419419.